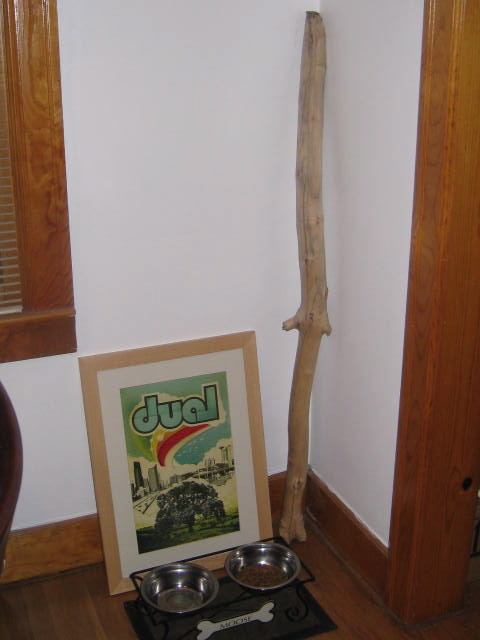 My poor pooch has this drab corner of our house allotted for his food and water bowl. It is so boring, one piece of art work, a walking stick (used to hang his stocking on for Christmas) and that's pretty much it. Well, have a look for yourself. I mean I love this print and all, but, Moose deserves a bit more than this I think. Recently, I have been noticing how much I love the colored, mixed matched sized frames. So, why not make a little pet corner for the Moose? After all, these frames are cheap and fabulous--if you purchase them from Homegoods, TJMaxx, and Marshalls like I did! 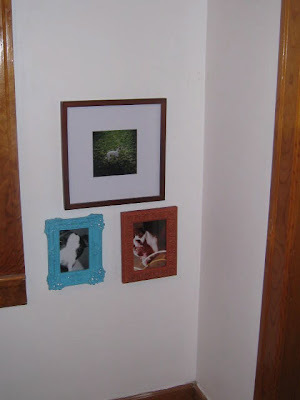 First, I laid my prints on the floor to get an idea of space and how I wanted to place them. A little to "boxy" on this try. Don't you think? Plus I was looking to extend this project from the bottom to the top of the windows..this wasn't going to work. Trial 2: Ah-ha! Perfect. An elongated version of the first try and hey look, Moose is even checking out how awesome he looks in all these photos. I love this print (rt), a couple of years ago Moose was in Live Spa magazine and this was the photo featured..the cute robe was ours to keep! Lastly, I quickly printed a greyhound coloring page onto scrapbook paper and wrote "happiness is a warm puppy," cut it out and placed it in the last frame for the finishing touches. As you can see, everything fit just as exactly as planned! 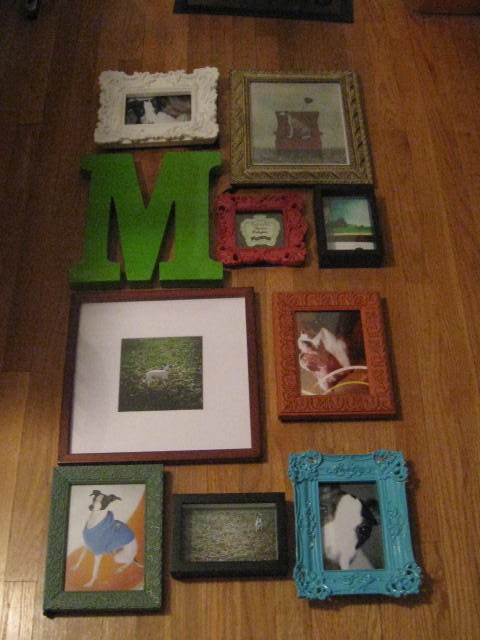 I also ran across the monogrammed M in that terrific green and had to have that! Moose can now enjoy his dinner in style and I can enjoy looking at my new display of happiness...my love sponge! Have a great weekend and check out other great blogs here! Those are some great frames! What a great way to freshen up Moose's wall. I love it! What a great idea! I love the frames and how it's all for Moose! I just fell in love with this idea!! I think I may have to figure out a way to incorporate this idea into our home. this is great!!! my pup, bear, is going to be so jealous! What a great little corner!! Frame galleries can be tough but you've totally nailed it. Looks great. Very cool idea. You're right...our furry little kids need photo love, too! This is so cute! Love the idea! Those mis-match frames look amazing clustered together. Is Moose an Italian Greyhound? He looks like he could be as he looks a little like our Twiggy, though she is grey. Love it! You're so clever with color! How Cute! Wow, my mind is reeling with dog art projects now. Thanks for the inspiration! I'm sure Moose is thrilled. Great idea and Moose has to love it and want to show off for all of his friends. Glad you didn't go with the first layout though. So cute! Is he a whippet? We just adopted two of them from a rescue place and love them! dying right now! so awesome. and thank you for reminding me that my dog's corner is in no way representative of him. i better get on that ;-)Nice Work!! aw I love this!! moose is very special!! Again, a fun vignette and project. Thanks for linking it to Motivated Monday at Becolorful.